Now that the new year is finally here, most of us are taking a more critical look at our body. Even though fat loss tips, tricks and pills are the big sellers every January, muscle growth is just as important. Adding quality muscle will not only increase your basal metabolic level (i.e., the calories you burn at rest) but it will also make you stronger and faster – if you add the right kind of muscle. Not all muscle is created equal. Cyclists and Olympic weightlifters both have heavily-muscled thighs, but the type of muscle that makes up the girth is significantly different. 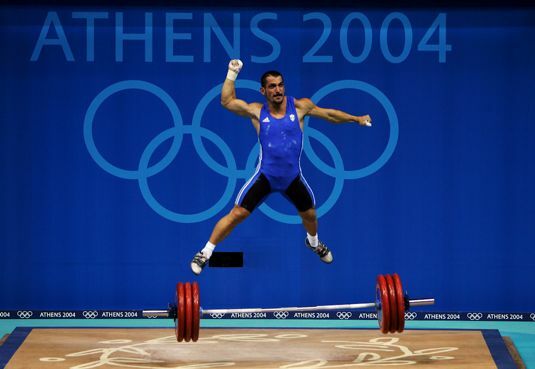 Since Olympic lifters alternate between heavy loads and explosive movements, they add size to the fast-fatigable (FF) motor units that consist of the type IIB/X muscle fibers. The FF motor units are the superstars of athleticism because they’re primarily responsible for making you bigger, stronger and faster. They come into play when you lift heavy or fast. You can also tap into the FF motor units by reaching a very high tension through an isometric hold or an intense squeeze of the muscle in peak contraction. Cyclists, on the other hand, spend tens of thousands of hours building the slow (S) and fast-fatigue resistant (FFR) motor units. The growth potential of the S and FFR motor units is less than FF motor units – significantly less when you compare the S and FF types. The quadriceps are one of those rare muscle groups that can grow with intense endurance training. Importantly, most muscle groups will shrink when they’re bombarded with a zillion reps at a small fraction of your maximum one-rep load potential. However, I don’t want to overload this discussion with motor unit physiology. My point in mentioning the O-lifters vs cyclist muscle relationship is that I don’t want you to build just any type of muscle: I want you to build the right kind of muscle. The muscle that makes you a more explosive athlete. Hypertrophy requires protein synthesis. Specifically, muscle growth occurs when protein synthesis is greater than protein breakdown. This results in a net protein accretion that can be seen in the mirror over the course of weeks and months. So to start off 2014, here are my top 5 ways to ensure that you add muscle as quickly as your physiology allows. You must provide your body the right nutrients, and train with principles that tap into the FF motor units. Imagine two identical twins that have to train with a single dumbbell for six months. Give one guy an 8-pound dumbbell and the other guy an 80-pound dumbbell. You know, of course, that the guy with an 80-pound dumbbell will build more muscle over the course of six months. The reason is because he’ll be able to recruit the FF motor units with virtually any exercise he chooses. In a study of the relationship between exercise intensity (% of one-rep max load) and protein synthesis, subjects who trained with 60-90% of their maximum training load induced the greatest levels of protein synthesis (Kumar et al, J Physiol, 2009). As a general rule, 60% of your 1RM is a load you can lift 20 times. So if you’re training with a weight that allows more than 20 reps on the first set, it’s not optimal for hypertrophy. On the days you lift with lighter loads that are close to 60% of your 1RM it’s imperative to perform the concentric (shortening) phase explosively. This ensures that you tap into the FF motor units, even when the loads aren’t within typical strength- and muscle-building loading parameters. When you train with loads that are 80% of your 1RM or greater, the speed of your shortening contraction phase becomes less important. A weight that only allows four or five reps will tap into your FF motor units, even if the movement is slow. However, it never hurts to try to lift heavier loads faster since it will increase the descending neural drive (i.e., the signal between your brain and muscles) more than if you tried to lift the weight slowly. The way you perform each rep can have a profound impact on your results. I already mentioned the importance of accelerating lighter loads, but there’s more you can do to trigger muscle growth. Regardless of the training load – assuming it’s greater than 60% of your 1RM – there’s a sure-fire way to get the most motor unit recruitment from each rep: accelerate the shortening phase, squeeze the peak contraction for at least one full second, and lower under control. By accelerating the shortening phase you’ll recruit additional motor units. Then the intense squeeze of the peak contraction further increases muscle tension to tap into the FF motor units. And when you lower under control it causes more myofibrillar damage than if you just let gravity take over. That extra tissue damage can lead to extra muscle over time. This three-pronged approach to each rep is much simpler, and more important, when you’re closer to 60% of 1RM. The likelihood of leaving the FF motor units out of the lift is greater when loads are lighter. That’s why it’s essential to perform the “acceleration/squeeze/lower under control” approach. However, when the loads approach 90% of 1RM your focus should be on achieving proper technique with the lift without regard for anything else. While in graduate school my thesis paper was on the muscle-fiber alterations between strength- and endurance-training parameters. For months I perused every research paper imaginable on the subject. Put simply: whenever possible, your body will convert the type IIB/X muscle fibers that have the most strength and hypertrophy potential into weaker IIA and I types. So if your goal is to develop more impressive thighs for spring break, keep in mind that low-intensity jogs will impede the growth potential in your quads, glutes, hamstrings and calves. Now, maybe you don’t care about losing some explosive motor units in your legs and would rather have a slimmer waistline? In that case, jogging is probably fine for you. However, my recommendation is to limit all cardio to 20 minutes, three times per week. An ideal progression is to run faster during those 20 minutes. Put another way, your goal should be to cover more ground in the same amount of time. Those 20 minutes are enough to reap the health benefits of cardio while minimizing the potential negative hormonal impact that low-intensity training can have on your overall muscle growth. A 40-minute jog might be good for your heart and endurance, but it definitely won’t get you closer to sporting thighs like Tom Platz. You can’t talk about muscle growth without mentioning nutrition. And you can’t talk about nutrition without getting into some biochemistry. (Well, you can but it typically won’t teach you much more than you already know.) So here goes. In order to maximize muscle growth you must leverage the balance between protein synthesis and protein breakdown in your favor. Your body is in a constant flux between build-up and breakdown, and the goal of training and nutrition is to tip the scale toward protein synthesis. That’s how you grow new muscle. Over the last few years, the AMPK-mTOR signaling system has become a hot topic amongst those with Ph.Ds behind their name. AMPK and mTOR can have opposing effects on muscle growth. AMPK activity reduces protein synthesis and muscle growth (Wackerhage et al, Strength and Conditioning). Contrarily, the mTOR pathway appears to be a primary driver for protein synthesis. The relationship between the two is certainly a complicated subject with many unknowns. However, it appears that insulin and amino acids can turn on the mTOR pathway – and subsequently enhance protein synthesis. I’m a proponent of performing cardio in a fasted state when fat loss is the primary goal. Once glycogen from the liver is used up, your body will start burning fat for fuel. But during the intense strength training that’s necessary for muscle growth, it’s safe to postulate that carbs and amino acids should be available to fuel your efforts. And it appears that the insulin response from carbs paired with the amino acids (namely leucine) from the protein will trigger protein synthesis via the mTOR pathway. So when I’m working with a client who seeks fast muscle growth, one piece of fruit combined with 20 grams of leucine-rich, whey protein is consumed 15-20 minutes before training. Thirty minutes after training another 20 grams of protein is paired with berries. You should experiment with different types of fruit to see which one works best for you. Most of my clients favor a banana, apple or orange with this whey protein. Add these five steps into your training plan and make 2014 the year that you gain quality muscle faster than ever. You haven’t posted in a while. I have implemented your high frequency training with nice results. I used this approach to bring up my arms. I was hitting my arms 3x a week for 4 straight weeks. I never went to failure. Most of the growth occurred during the 5th and 6th weeks (I rested during these weeks). Dan Trink calls this the Supercompensation Slingshot – where you strategically overtrain, then rest, and this is when the growth occurs. CW: Thanks Dan! Don’t worry, there will be plenty of HFT talk coming soon followed the sequel to my HFT system. I liked all the points you made, although I do have one question. In your most recent book about diet, The Waterbury Diet, you state that eating food stimulates the parasympathetic nervous system, which has a calming effect, slows down your heart rate, etc. So… why would I do that before going to the gym? I feel like if I ate an apple and had a protein shake 15 minutes before working out, I’d start feeling nauseous after performing some lifts. Maybe because blood is leaving my skeletal muscles and going to my stomach instead? I guess it really all depends, since certain foods have different digestion rates. I don’t know, I could be wrong. It’s been a while since I read the book. CW: Kyle, my statements about the PS response was aimed specifically at large meals. A banana with a scoop of whey doesn’t cause that effect. You could also try the fruit/shake combo 30-45 minutes before training so the food has time to digest.